If you’re like most finance professionals, you recognize the value of effectively communicating data. But you’re often stuck using spreadsheets for what they were never intended to be—a reporting solution. Fill out the form below to read "3 Ways To Step Up Your Financial Reporting"
You’ve heard all the stereotypes. As a finance pro, you’re known as left-brained. Logical. Analytical. Calculated. Careful. There’s some truth to these labels—for good reason. Aside from the CEO, perhaps no other role has as much visibility into the operations of your business. But these insights don’t come easy. It’s not uncommon for you to spend hours poring over spreadsheets in an attempt to keep your finger on the financial pulse of your organization. What’s not ok is expecting everyone in your organization— from corner office to cubicle—to see things the way you do. Hard numbers—housed in rows and columns of 6-pt type, anchored by vlookups and elegant macros—may be your wheelhouse, but they aren’t, and shouldn’t be, for everyone. So here’s the inconvenient truth: Finance reports frequently fail to communicate effectively. They’re often difficult to consume, overwhelming, dated, and lacking context. Let’s explore how that can change. Everyone understands finance will never stray from spreadsheets and its hard data, number-crunching roots. And they never should. But for some, a spreadsheet in their email inbox incites a specific type of dread. And too often, if it’s boring and overwhelming, it won’t be read—and that makes it next to useless. Fortunately, data visualization makes complicated, detailed data easier to digest. In that regard, finance pros could take a page from popular personal finance app, Mint. Sure, the app is made for everyday consumers, but it does something your complicated financial reports don’t—deliver information in an extremely visual way that’s easy to consume. By connecting to each financial account, the app automatically organizes spending into categories and shows where each penny is going in easy-to- understand charts and graphs. Immediately upon logging in, a user can see a series of engaging visualizations that visualize everything from morning latte purchases to net worth over time. Armed with that information, users know exactly how to adjust their spending habits to keep (or get) their finances on track. With these data-driven visualizations, even those without technical or financial expertise can intuitively gain insights into their finances. The same can be true for your reports. Data storytelling should be accessible to anyone. The more you keep people in the loop, the greater the possibility to uncover stories you didn’t know were there. Visualization allows users to explore data in ways they see fit, as opposed to the way someone else saw fit to allow them. The flexibility to join different data sources as desired, view patterns on the fly, and iterate can unearth important insights faster. It pays to have everyone on the same page. Visualizations make data more accessible to everyone, and helps even the least data-centric employees draw more sophisticated insights. It’s simple: For many, seeing is believing. And for data to really drive results, it needs to be delivered visually. Interactive charts, heat maps, and data relationship maps and trees help key stakeholders make better and more confident business decisions. When you free data from its cells, you can present the nitty-gritty details of your business in ways everyone can understand. Which would your CEO prefer? Informed decisions are the foundation of any strong business. But as your organization grows, so does the financial data that flows through it—and organizing it all can be a painstaking and time-consuming process. Yet this flood of financial information can have a huge strategic impact for those who know how to turn it into quick, actionable insights. The challenge for finance is that every department collects data that have financial implications. Maybe it’s cost-per-lead from marketing. Or commissions by rep from sales. Or employee headcount from HR. Finance needs to get its hands on all of this, and that collection process is never easy, or timely. By the time someone takes hours to cobble this information together, put it in a report and deliver it to stakeholders, its information is outdated. And outdated data leads to uninformed decisions. The solution? For many, it’s visual data discovery tools that sit directly on top of business data. These tools speed the time to insights by enabling stakeholders to find answers to their own finance questions, without waiting on reports. Organizations that take advantage of data discovery tools are 30% more likely to find information to support timely decisions, compared to those that rely on traditional reporting. And that could mean 30% more decisions based on fact rather than intuition. Financial reports are just one piece of the puzzle. In order to make smart decisions, executives often need to see financial data alongside metrics from other corners of the business. For example, you might report that Q/Q sales are down 13% in Asia-Pacific. Good to know, but not actionable. But what if you were able to report that same data alongside a graph of declining CSAT scores for the same region? All the sudden your finance data doesn’t exist in a vacuum—there’s correlation to explore and action to take. Simply put, when presented without context, finance data doesn’t communicate nearly as much value. According to research, only ~10% of all enterprise businesses integrate their data sources. In the vast majority of organizations, data continues to exist in silos—which makes it difficult to see how one piece of your business’ puzzle affects another. Enter Domo. Domo pulls spreadsheet data, alongside any other source of data, together in one intuitive dashboard. It sits on top of your well-ordered spreadsheets to give you and your exec team real-time, fudge-proof information, wherever you happen to be. Even better, you can see this data any way you like, and package it up in a way that’s engaging, accurate, automated, informative, insightful and, most importantly, simple for the end user. 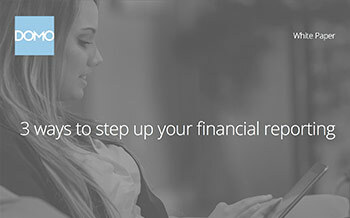 In doing so, you’ll put reporting spreadsheets to rest, and become the financial darling of your organization.